When trying to plan a corporate bowling party, you'll need to keep track of quite a few things. Making a list and sticking to it is really the best way to get a project like this accomplished. Outlining your tasks make it easier to plan and pull off a fun, successful event. Step one in planning your party is to find out how much the company plans to spend on the event. Once you have a budget to work with, you can begin your planning. In addition to reserving lanes, you'll want to figure in the cost of bowling shoes, a separate party room, and food and drink for everyone. Select a potential date so you can send out an initial communication about the party that will help you gauge interest and ascertain the number of attendees. Also include whether the employees may bring spouses and children to the party since you'll also need to include those guests in your count. This info will help you select a suitable location that can accommodate everyone. It's best to choose a bowling alley near the corporate offices in case employees choose to carpool to the location. Be sure to call well in advance of your event to secure the number of lanes you'll need or even the entire bowling alley. You will probably be required to make a deposit to hold the date. There are many ways you can provide food and drinks for the event. One of the first decisions you will need to make is whether the event will be alcoholic or non-alcoholic. If alcohol is allowed, it may be wise to use drink tickets that limit the number of beverages employees can consume and thereby save money and prevent behavioral issues. It's also a good idea to check with the bowling alley to see if they will even allow you to bring in food. If the alley will allow you to cater the event, check at least two or three local caterers for selection and price. Be sure they are available on the date of the event and check their references. Decide on a party menu a few weeks in advance. If the alley allows you to bring food in and the party is for an event (such as a holiday celebration or coworker's retirement), don't forget to bring in a special cake or dessert that honors this person or celebration reason. Once you have the date set and the location booked, it's time to send out the official invitations. Make sure you do this about two weeks before the event and ask everyone to RSVP so you can get an accurate head count. This will help you plan the menu and any other important details. Be sure you include all the really important info, including what the company will provide versus anything the employees may need to pay for themselves such as shoe rental. If you will be using any party décor, purchase it and create a small crew of fellow employees to help with the setup and teardown. Decorations will be important if you're hosting the bowling party for a special reason, like a retirement celebration or year-end holiday party. Look for themed decorations or simply select color-coordinated streamers, tablecloths, and party centerpieces. As the event draws near, create a final attendee list, including members of the management team who will be joining the employees at the party. If supervisors or company administrators plan to speak, be sure that they have everything necessary to address the company at the event. After the guest list has been finalized, decide how you're going to handle the actual bowling before the big event. This streamlines the process for everyone and ensures a fair and fun event. The bowling alley you select may have a limit on the maximum number of people allowed in one lane. However, keep in mind that the more people you put in a lane, the longer it will take to play a game. Consider groupings of four to six; that's enough people to socialize but not so many that it will take a long time to get through a whole game. Divide the RSVP numbers by your selected team member number to get the amount of lanes needed, shifting a few people to an additional team if the division isn't even. Consider booking an extra lane if there's a possibility people will come who forgot to respond. Random: Put lane numbers into a hat and have people draw their lane number upon signing into the event. Department: To foster team-building, have people from the same department work together on a team. If there's enough people to make several teams, put them in lanes near each other. Interdepartmental: Have each person on a team be from a different department. This is a great way to help employees get to know each other. If you plan to have a second activity, such as speeches or awards, you will want to limit the number of games to one or two. Keep in mind it takes approximately 45 to 60 minutes to bowl a 10-frame game with about five people. If you have additional time left at the end of the evening, you can let employees bowl until a few minutes before the lane reservations end. If no other activities are planned, then allow teams to bowl until the reserved lane time ends. If your corporate bowling party is being held to honor employees or to provide awards to certain departments, be sure to order these items in advance and don't forget to bring them on the day of the event. If the awards/certificates are being handed out from the management team, be sure to have a podium set up for presentation with a small table next to it. On the day of the corporate bowling party, go over your checklist one final time to ensure that everything is ready to go. Station someone at the front door to guide guests to food tables or to their assigned lanes and hand out drink tickets if applicable. Make sure employees know where to pick up their shoes and bowling balls. Hand out a schedule or program if applicable. Brief the speakers that will be handing out awards if necessary. Alert them to any difficult-to-pronounce names. 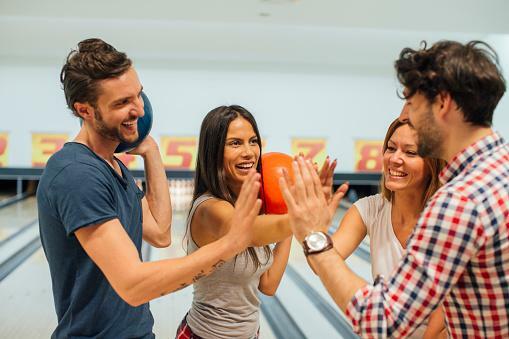 If you've rented the entire alley, utilize the PA system to announce when bowling begins, when food is served, or when a speaker will start addressing the group. 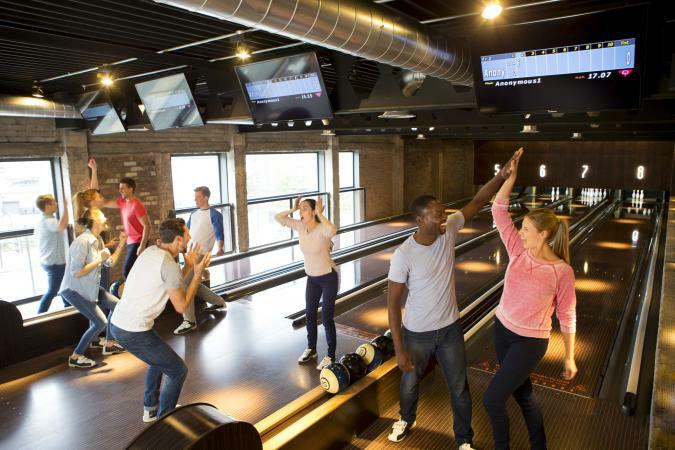 When planning a bowling party for your company, there are many things to remember. However, the most important thing is that everyone has a good time bowling and socializing with their coworkers and friends. If you've planned your event well, everything should run smoothly. This will allow you to relax once the event gets rolling and enjoy the fruit of all your efforts.